All craft enthusiasts love to make things sparkle...don’t they? Well for those that do the JosyRose online haberdashery has the perfect range of diamantes for you to choose from including charms, beads, motifs, trims, buttons, stones and so many more! Josy Rose has something for everyone and for all projects. Diamantes are extremely versatile and look good on any type of craft project. Available in a vast selection of colours and sizes they can be used on both fabric and paper. Depending on how you choose to use the diamante range JosyRose have a great range to make the job as easy as possible including hot fix, sew on, self adhesive and glue on diamantes. Maybe you are making your own wedding or celebration stationery? If you are diamantes are a great way to embellish your creations and give them a really expensive look and feel. If you do use diamantes when creating stationery for a special event JosyRose even stock cute scatter stones that are perfect for scattering on tables, so not only can your invitations and table name cards sparkle so can the table itself! Little girls love sparkles and sticking so why not buy some of the glue on diamantes and let them get creative, if the thought of glue and your girls fills you with a sense of dread an ideal alternative is the self adhesive diamantes collection, much less mess! 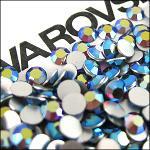 The self adhesive gems are silver backed and strong enough to add sparkle to a mobile phone or Mp3 player. For more serious crafters JosyRose also stock a gorgeous range of Swarovski vintage diamantes. Available as glue on or in claws these can again be used for any craft project that needs a little bit of bling! The Swarovski diamantes are available in a range of colours and sizes, if you need any advice or assistance when choosing the right ones for you and your project the team at JosyRose are experts and are more than happy to help.